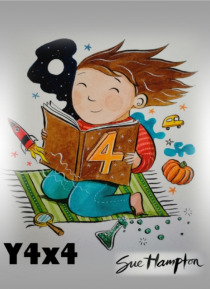 From Sue Hampton, who taught many Y4 classes before she became an author, this is a collection of four stories with fun in common. KOOT IN SPACE: On Koot's first mission as a Space Cadet, he has to forget he's hopeless, and outwit the colossal creature that left bite marks in an abandoned space station. DORA THE BOT: Erin meets a satnav with personality that takes her places where only imagination… can lead. HALLOOO IAN: Ian, who was born on Halloween, tries to be scary but everyone only finds him funny - until The Thing appears to terrify him and his family, and there's only one way to defeat it. QED: Clever Jimbo likes to experiment on people, but when his research begins on holiday, things go horribly wrong for the wannabe Professor, 'dangerous' Claire, Pavlov the dog, and Bertie, the baby who laughs as wildly as he cries. Fantasy can feel real. Sue's playful style creates original, sometimes surreal stories with a human heart.